What is Text to 911? 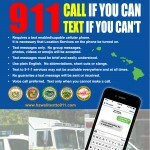 Text to 911 is an emergency service that is provided to all mobile users in the State of Hawaii. It allows someone to use their activated cell phone to contact the 911 center via text message instead of calling 911. That’s Awesome! So I should just use the texting because it’s easier than calling? Actually, no. Calling 911 is still a faster, more efficient way of relaying an emergency to the Police, Fire, Ambulance, or Ocean Safety. Calling 911 will also provide the 911 center with access to your location. Texting to 911 should only be done when you are unable to make a voice call. So, when would someone use text to 911? If you are in a situation where it is not safe to place a voice call to 911. If you are experiencing a medical emergency that renders you incapable of speaking or hearing. If you are unable to call 911 due to being in a location with sporadic cellular voice service. If you are unable to speak or hear due to injury or physical restraint. If I am able to text to 911, will the 911 center automatically know my location? No. Per the FCC: Texting to 911 is different from making a voice call to 911 in this respect. When you make a voice call to 911, the call taker will typically receive your phone number and your approximate location automatically. This is called “Enhanced 911” or “E911.” However, in most cases when you text 911 from a wireless phone, the call taker will not receive this automated information. For this reason, if you send a text message to 911, it is important to give the 911 call taker an accurate address or location as quickly as possible, if you can. I see…so what do I do to text if I have to? You simply send a text to the number 911 like you would any other text. Keep in mind, text messaging was never meant to provide emergency services, so your text may take longer to reach help, and the 911 Center will not automatically know your location so you’ll have to be specific in providing that. What do I say in a text? You will need to provide your location and the type of emergency you have (Police, Fire, or Ambulance) and address if you know it, including floor or room number if you are in a building. Send brief messages, but please don’t use abbreviations. Also remember to use plain English language. The 911 Center Dispatcher will then respond with text questions pertaining to your situation. Can I send a picture or video of a bad accident I just saw? No, unfortunately Text to 911 only can support ordinary SMS (Short Messaging Services), which is a plain text message limited to 160 characters per text. Pictures and videos currently can’t be sent to us. Emoji won’t work either. Does my phone number have to be a Hawaii phone number to use this? No. The service will work as long as you send a text to 911 and have an active (US) cell phone. 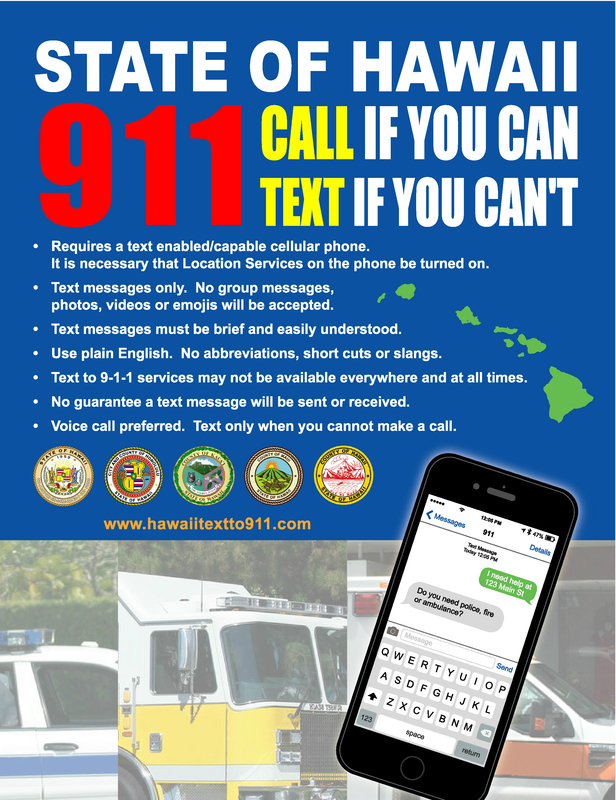 For example, if you are from California and visiting Hawaii , your text message will reach a local 911 Center in Hawaii. What about a cell phone that has no service? I know those phones can still call 911; can they text to 911 too? Sorry, no they can’t. It has to be a text enabled phone with a current text plan to work.